ColourVue Solar Blue contacts are one of the very few crazy contact lenses which can be successfully used as an every-day cosmetic accessory as well. They provide a noticeable, yet very natural eye color change. It doesn't matter if you have dark or light eyes, Solar Blue lenses are opaque enough to work for everybody. Of course, as they are considered crazy lenses, they can be also used in any kind of costume event requiring noticeable eye colour change. 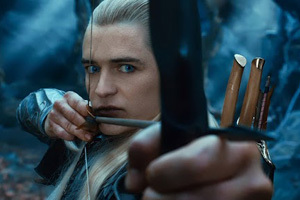 ColourVue Solar Blue contacts will also be perfect for all those who loved the way Orlando Bloom looked while he portrayed Legolas in The Hobbit movies - his eyes were incredibly blue thanks to beautifully blue contact lenses.